As we make our way out of winter and into the springtime, it’s time to rediscover the great outdoors, especially when it comes to dining out! 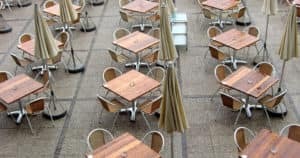 We’re extremely lucky in Indianapolis to have such a huge selection of restaurants with outdoor patios to choose from. So, next time the sun is shining, and you don’t feel like cooking, why not head on down to one of these great local restaurants? Here are a few of our favorite outdoor establishments. If you love local food, then you’ll love Bluebeard. All their ingredients are sourced from local farms. Luckily, the chefs put as much care into preparing their food as they do into sourcing it, meaning every bite is simply bursting with flavor. Serving up a great mix of American classics with some more far-flung creations — such as their authentic hearth-baked Italian bread — it’s easy to see why so many Indianapolis locals love this place. Nothing says outdoor dining like the summer staple: burgers. If you’re in the mood for a hearty helping of this American classic, then look no further than BRU Burger Bar. They don’t do anything by halves here, as even their “snack-size” burger weighs in at a meaty 1/4 pound of beef! There are plenty of different burger options to choose from, whether slathered in bourbon sauce or buried under a mountain of freshly-made BBQ sauce. They also offer fresh salads, sandwiches, appetizers, and desserts, too. Their beer-battered onion rings are delicious, as is their unique roasted jalapeno mac and cheese, so be sure to leave some room for them as well. You’ll want to work up a healthy appetite before you head down to BRU Burger Bar! Being so far away from the ocean, it can be tricky to find good seafood in Indianapolis. However, there’s one restaurant that can rival even coastal eateries for their freshly caught, delicious creations: Caplinger’s Fresh Catch. Serving as both a seafood market and a restaurant, it’s a must-visit place for anyone who love this type of delicacy. They offer a variety of sandwiches, entrées, sides, and desserts. From their legendary crab cakes to their smoked tuna salad sandwich, everything on the menu is worth trying. Although it’s located a little further from downtown Indianapolis, we still recommend that you make the trek. Whatever you’re in the mood for, chances are you’ll find it at The Eagle on the corner of Delaware Street and Mass Avenue. Serving up all sorts of comfort foods on a lively patio, it’s easy to see why this place is always packed. Be sure to book ahead if you’re in a rush, so you can enjoy some of the tastiest mac and cheese in Indianapolis, along with fried chicken, spoonbread, and more foods that feel like a great big hug for your tummy. It’s also worth noting that The Eagle has an enormous selection of beers and other drinks to choose from, so it’s a great place to relax with friends after you’ve finished your meal. Make sure to soak up the sun as soon as it comes out! Head to one of these Indianapolis restaurants and you won’t regret it.